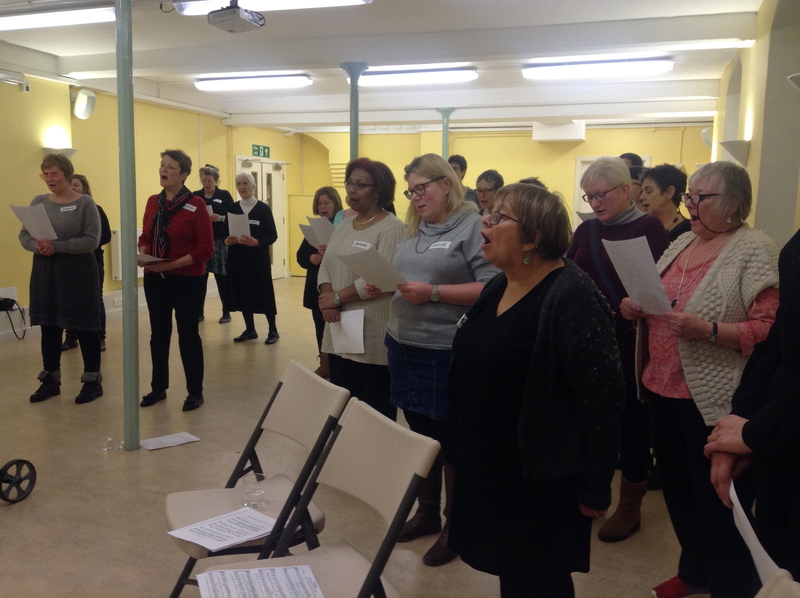 For our March meeting we welcomed singer and choir director Barbara Hoëfling who gave us a fantastic crash-course in singing in a choir and which concluded with her conducting us in a rousing version of ‘Jerusalem’. Originally from Germany, Barbara has been living in the UK for 10 years and conducts a number of choirs including the one at St Peter’s, De Beauvoir. She started by telling us about the history of ‘Jerusalem’, a piece that is integrally linked with the Women’s Institute. The text of ‘Jerusalem’ was written by William Blake in 1808 and set to music by Hubert Parry in 1916 two years before he died in the Spanish Influenza epidemic. Parry was a Professor of Composing at the Royal College in London and was highly regarded by Elgar who went on to write the uplifting symphonic orchestration of Jerusalem that we are all familiar with today. Parry also taught Holst, Vaughn Williams, Frank Bridge and John Ireland among many others while at the Royal College. Parry and his wife were supporters of the Women’s Suffrage movement and when the National Union of Women’s Suffrage Societies (NUWSS) asked Parry if they could use Jerusalem at a Suffrage Demonstration Concert in Leeds in 1916, he orchestrated the piece and then assigned the copyright to the NUWSS. When the NUWSS was wound up in 1928, Parry’s executors reassigned the copyright to the Women’s Institute where it remained until it entered the public domain in 1968. Many of our number revealed difficult experiences in past attempts to sing, especially at school with memories of being sacked from the choir, or told to learn an instrument instead but Barbara was very encouraging about everyone’s capacity to sing and about the benefits of singing. It can improve sleep, releases endorphins, expands lung capacity, gives our immune system a boost and even tones our facial muscles. It brings people together, increases feelings of wellbeing, encourages positive feelings and creativity and is a forum for fun and laughter. We started with some exercises to get going and then some singing exercises, initially humming along to the tune of Jerusalem and then singing the words. 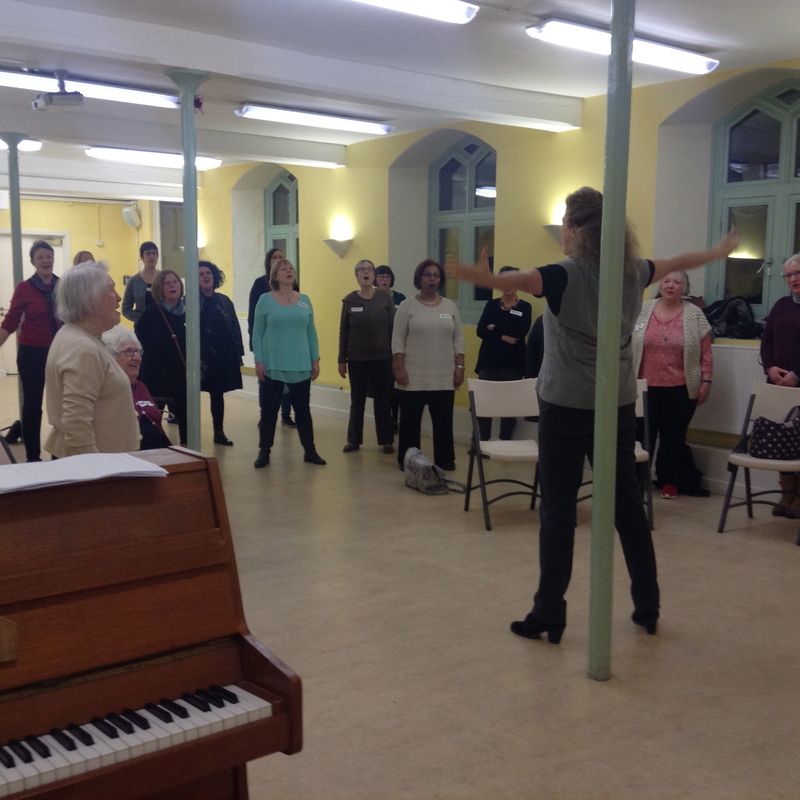 At every point Barbara was positive, really encouraging, sharing her knowledge and tips and as we grew (a little) in confidence, the singing started to get louder. Lots of trips for liquid refreshments enabled us to lubricate our throats though I for one, was a little croaky the following day – as Barbara put it, akin to sore muscles after a good workout. We were joined by Romee who played the piano accompaniment with passion and verve, which spurred us on to sing out louder. I found the final versions truly uplifting. Romee also revealed that when William Blake had been writing the text, he was looking out of his house south of the river onto the green hills of Islington.